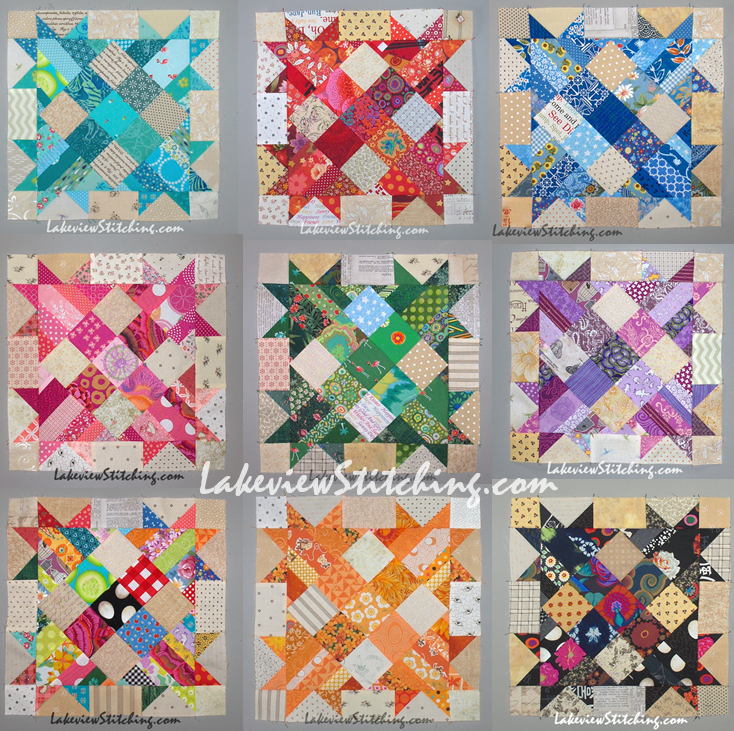 It's the last Saturday of 2017, which means it's the last link up for the 2017 Rainbow Scrap Challenge. This was my first year participating in the casual, choose-your-own-project link up, and I have really enjoyed it! Everyone has been lovely, and you can't go wrong looking at a lot of colourful projects every week. 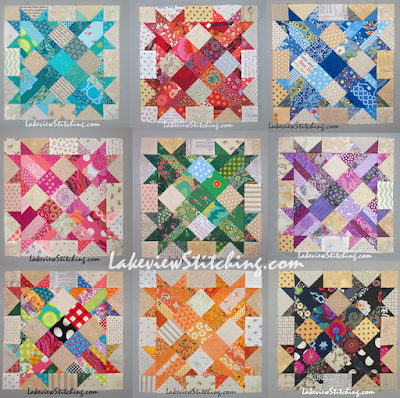 I started the challenge halfway through the year, and made a few of Bonnie Hunter's Talkin' Turkey blocks each month. This is a photo collage, since the top is still not sewn together! The grey background is just the back of my cutting mat, and I actually love the way it works for photos. The camera seems to "see" the colours more accurately, and there's less shadowing with the seam allowances. In fact, I like the grey so much that I've decided to use grey instead of pink for the sashing on Moth in the Window, which you'll see again with my New Year's resolution in a couple of days. 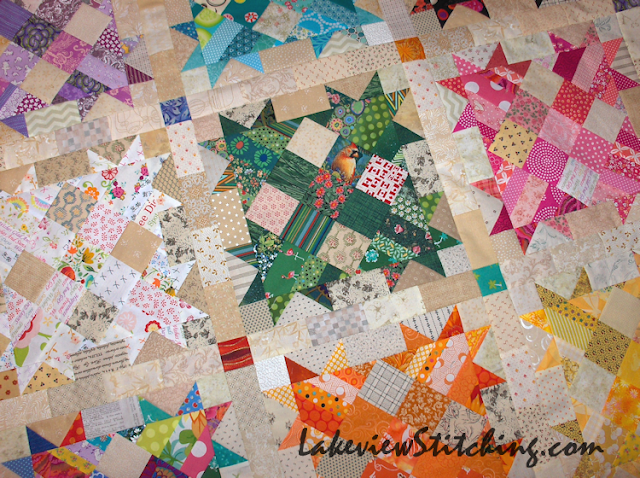 With scrap quilts it is always a challenge to keep pieces of the same fabric from being sewn together into a clump. I realized that if I use a completely different set of fabrics for the sashing, I will be home free! Fortunately, I had just restocked my selection of beiges, so I used many of the new fabrics in the sashing. Now it is just a question of buckling down and sewing the rest together. I won't let myself start on my 2018 projects until this is done! And, there are two 2018 projects planned. This ambitious rainbow layout, that I shared before, is on. It seems that everyone loves a rainbow! You'll see the full horror drama of that plan when I actually start it. 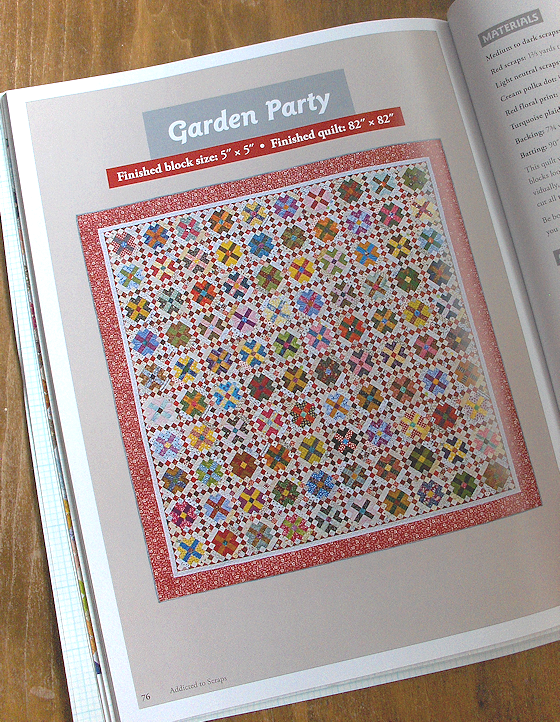 The second, more relaxing, project will be another Bonnie Hunter design, Garden Party from her book Addicted to Scraps. I'll make those blocks only when the colour of the month is a flowery colour -- pink, purple, red, orange and yellow. And maybe white too! I plan to change the setting a little, and it'll be shades of green, blue green and aqua. Katie has just finished her pretty RSC17 version of Garden Party, which you can see here. I think she had a smart idea to make this quilt as an RSC project, since it has so many blocks and so many small pieces. So I am following her lead! There are other wonderful finishes too in the RSC link up this week. But really, I recommend the whole month of December, which you can see if you click here. I'm looking forward to 2018! OMGosh, your talkin turkey quilt is just gorrrrgeous! and the sashing is perfect. Love your talking turkey! One of these days I will make one.... but must be good and finish off some things first. Looking forward to that rainbow teaser. The talkin turkey blocks are amazing! Love the name Technicolor!! I love your technicolor turkey and may just have to use your idea! And using gray for the sashing is a great idea! It’s a beautiful quilt. Talking Turkey is going to be beautiful! Those are some of my favorite blocks that I've seen anyone working on this year. Have fun with your new ideas, too! Your turkey blocks are glorious - what a beautiful quilt they will make. Love that scrappy setting, too. The sashing for Talking Turkey is perfect! What a wonderful quilt this is going to be!! Your rainbow comment is intriguing. I look forward to reading about it. Love your technicolor turkeys. The sashing looks terrific Your next rainbow project looks very interesting and exciting. Absolutely gorgeous blocks and lovely to see the collage of all of them. I really like your idea of pairing a Bonnie Hunter pattern with the RSC!! There are SEW many of her patterns that I want to make. Following your lead may be just the way for me to tackle some of them! What a great way to finish the year. It’s really uplifting - and pretty. It’s also interesting that the beiges do so much work, without drawing the eye at all. Very clever. The rainbow will, I imagine, be quite a different challenge! Happy New Year. I love the scrappy beige sashing and these are some of my very favourite blocks of the year. I'm looking forward to seeing what you get up to in 2018 too. Happy New Year!!! What a great technicolor turkey! Love how your blocks came together! The sashing on your talking turkey blocks is great. 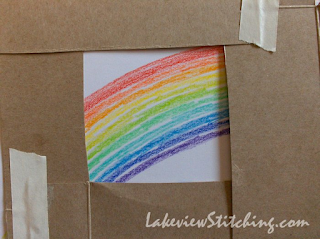 Perfect for the rainbow scrappy blocks. Enjoy Garden Party. It is such a fun pattern, definitely on my list for someday. Technicolor Turkey coming along beautifully! I’ve been anticipating this one for months and can’t wait to see it. Your sashing is great! And it reminds me that I need to restock those warm neutrals!! Happy New Year!! I think you’ll really enjoy Garden Party. I’ll have to make it again! Full size, since I enjoyed it so much last year.